Yahoo! Another growing season! In the past few months we’ve been planting, transplanting, weeding, watching things grow, and now we are happy to have vegetables at the market for you! Our hoophouse is back up and in production with 11 varieties of tomatoes, 3 varieties of cucumbers, and 4 varieties of peppers! We’ve never grown peppers before and are excited to see how it goes. We are also trying a few new kinds of tomatoes and cucumbers as we strive to find our and your favourites. We have a new helper this year in the garden! Briar was born last fall and already is digging in the dirt with her big sister. This month we will have: Lettuce, Green Onions, Peas, Radish, Salad Mix, Beets, Swiss Chard, Summer Turnips, Kale, Carrots and more! 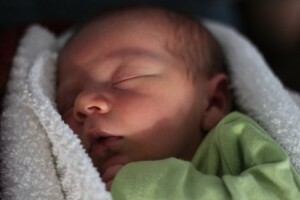 On October 30th we welcomed Briar Wren Slater Hodnett to our family! She is a happy, healthy kid and can’t wait to grow up and help in the garden. Rowan is currently teaching her how to take carrots out of the bin and how to eat raw potatoes – she’ll be a pro in no time. This month we will have: Beans, Beets, Cucumbers, Carrots, Leeks, Salad Mix, Kale, Onions, Radish, Zuchinni, Winter Squash, Summer Turnips, Lettuce, Green Onions, Broccoli and Tomatoes! 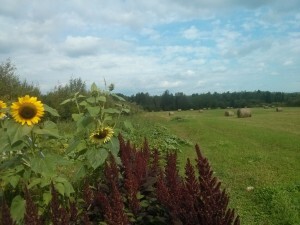 Come by our farm at 3282 North Tetagouche Rd between 10 am and 2 pm on September 13th to pick up your veggies, get a tour of the farm and enjoy the *hopefully* good weather! On Saturday we will have Acorn, Butternut, and Zepplin Delicata Squash – as well as tomatoes, lettuce, cucumbers, beans, kale and more! Calling all potato lovers! 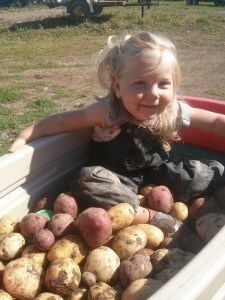 We will be hosting SteadySpade Farm’s 2nd Annual Potato Party on Sunday, September 21st from 3-7 pm. What is a Potato Party? Well, it’s a chance for everyone to dig in the soil and find potato treasures! We will be harvesting all 4 varieties of our potatoes, having a potluck supper (around 5:30) and everyone will leave with a bag full of potatoes! Bring your pitch forks and boots! 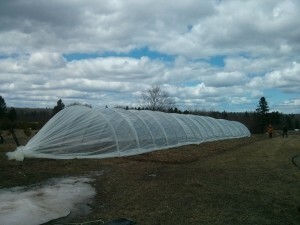 We are now well into the growing season with lots of veggies heading your way. In July we were very fortunate to have very minimal damage from Hurricane Arthur. 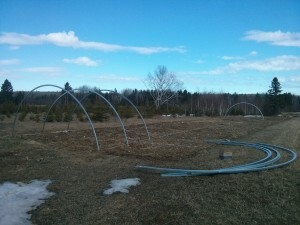 We had closed down the sides of the hoophouse and it stayed put. Everything in the garden is growing well! We have had a number of people come and help us in the last month hailing from France, Germany, Finland, Tawain, Australia, Canada and the States! 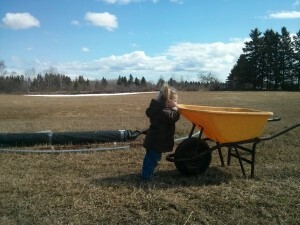 We connect with these international travellers through a couple of different website networks including www.wwoof.ca, helpx.ca, and couchsurfing.com. We offer an exchange of room and board for help in the field. It is a skilling sharing experience for everyone! 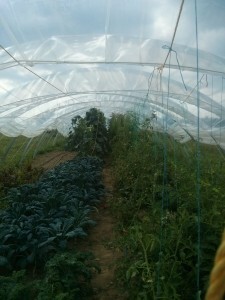 For those of you closer to home who want to learn more about growing food, or just want to harvest your own tomatoes, we also offer a work exchange where you can come to our farm, work for a couple hours and leave with a bag full of veggies! Win win for everyone! This month we will have: Yellow and Green Beans, Beets, Cucumbers, Carrots, Leeks, Kohlrabi, Salad Mix, Kale, Onions, Radish, Zuchinni, Winter Squash, Summer Turnips, Lettuce, Green Onions, Peas, Swiss Chard, Broccoli and Tomatoes! It was an interesting start of the season with the late spring of wet and cold weather. Last year we had started planting in the first week of May. This year we weren’t able to till until the end of May! 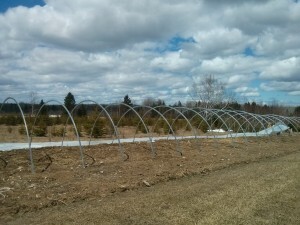 Even so, we were able to plant in our new hoop house and we had started many more seedlings this year, which gave everything a good head start. We have been very fortunate to have some visiters to our farm during the last couple months who have helped us with the garden. 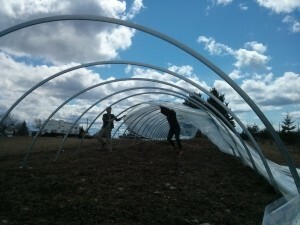 Roosa (from Finland) and Marion (from France) came in May and helped us with seedlings and with putting up our hoop house. (Check out our website for more details on The Tunnel!) In June, Mirjam came from Germany and stayed with us for almost three weeks. 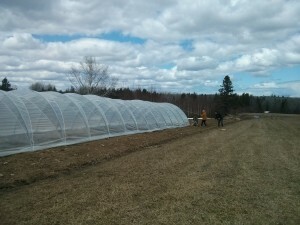 She worked a lot in the Tunnel and in the fields, watering and transplanting seedlings. 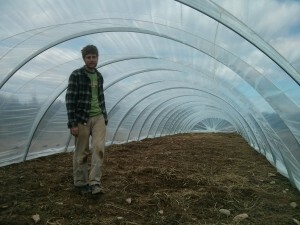 Clement is here now from France and has been working hard in the field. We love having people come work with us. Everyone has different experiences to share! Throughout the summer we will have a variety of vegetables at our table, as well as recipes to go with them! We are excited to share our food with you! 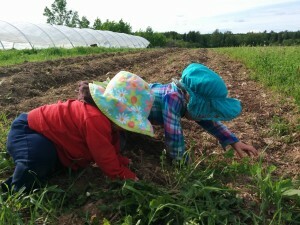 This month we will have: Rhubarb, Lettuce, Green Onions, Peas, Radish, Salad Mix, Beets, Swiss Chard, Summer Turnips, Kale, Carrots and Broccoli! Later in the season we will have: Yellow and Green Beans, Beets, Cucumbers, Carrots, Leeks, Kohlrabi, Salad Mix, Kale, Onions, Radish, Zuchinni, Winter Squash, Summer Turnips, and Tomatoes! We love hearing from our customers, so feel free to contact us. We encourage you to come and visit us and be a part of the food you eat! Please call us to arrange a visit. You can find us at the Beresford Market every Saturday from 8-1. We hope to see you there!